Osteoporosis is when bone becomes more porous and thus more brittle as you age. Osteopenia is the precursor to osteoporosis, and while osteoporosis normally only occurs in elderly people, osteopenia is common among young women, too. Osteomalcia is another problem, this time due to soften bones, and is primarily due to vitamin D deficiency. Combining all three of three problems, approximately one in two women and one in four men over the age of fifty suffer at least one broken bone as a result. That’s 50% of women and 25% of men! Unfortunately, osteoporosis is poorly understood by conventional wisdom and the public at large. Most people think it is simply a problem of not getting enough calcium in the diet. They try to make up for this by taking calcium supplements. But this is misguided. There is much, much more complexity that goes into how healthy bones are made. Fortunately, the paleo diet is excellent for helping us understand and nourish this complexity. Below I list the ten most crucial insights into osteoporosis and how to prevent it. Conventional wisdom is right that calcium is necessary for healthy bones. How much however is a question up for debate. The US governments recommends that adults get between 1000 to 1300 mg of calcium daily, though in reality only about 800 mg may truly be necessary. Try to hit the 800 mg mark with just food every day, and that’ll go a long way toward protecting you against osteoporosis. You can also try to do so with supplements, my favorite of which is this one. Few people know that magneisum is also crucial for healthy bones. Adequate magnesium is essential for absorbing and storing calcium in bones. Magnesium and calcium often work hand in hand in the body, and in the bones is no exception. Any time calcium needs to get into a cell, magnesium is necessary for opening the channel in the cell membrane for it to pass through. There are not very many foods high in magnesium in the paleo diet. Dark leafy greens may be your best bet. Nuts and legumes have decent amounts of magnesium in them. 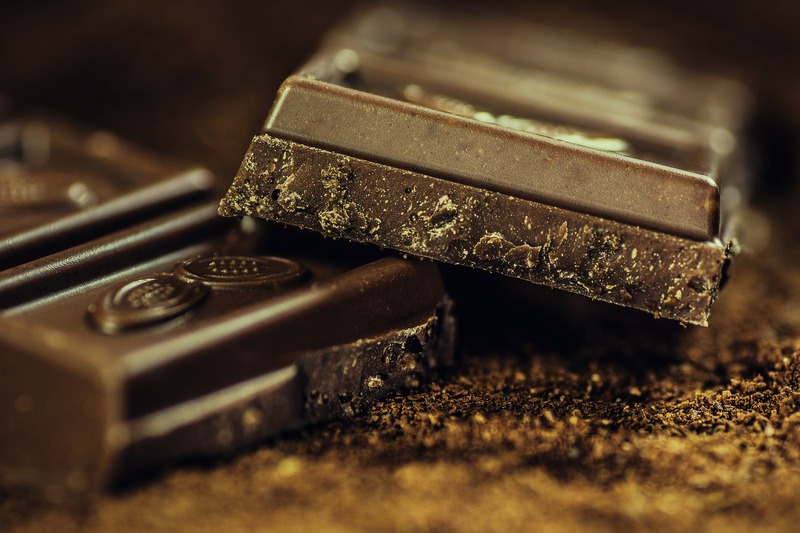 Dark chocolate is relatively high in magnesium, too. Avocadoes, bananas, and yogurt also have decent amounts of magnesium in them. Since magnesium is so important for health and for bones, I often recommend that women take a magnesium supplement. It’s one of the very few supplements I recommend on a regular basis. For anyone who may be concerned about bone health, an excellent supplement that meets both of these needs is Osteocalm. Osteocalm which is a delicious, fizzy powder that contains bioavailable amounts of calcium and magnesium in good balance. Having good gut health is crucial for preventing osteoporosis, because without a healthy gut, the body won’t be able to absorb the calcium, magneisum, and other important nutrients the body needs. 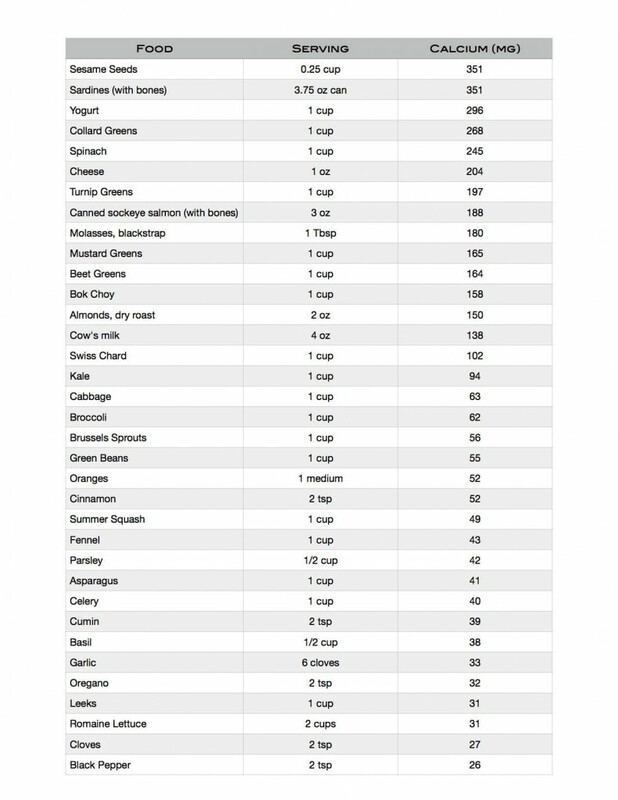 Unfortunately, assuring that you have a healthy gut is far more complex an issue than I can address as a small item contained within this post, though I can generally recommend that you work through any gastrointestinal symptoms you may have with a functional medicine doctor or gastroenterologist, that you regularly consume probiotic foods like kimchi, sauerkraut, kefir, or (coconut) yogurt (soooo good), that you consider taking a high quality probiotic supplement, and that you avoid potential gut irritating foods like grains and dairy. Not only do grains irritate the gut and potentially cause leaky gut issues, but they also contain high amounts of anti-nutrients. Anti-nutrients are molecules that are found in high quantities in grains (though also in fairly high quantities in legumes and nuts, and even in some vegetables), that bind with regular nutrients in the gut. Phytonutrients are too big to pass through the intenstinal wall into the bloodstream, so they get excreted out of the colon, and take the good nutrients with them. A diet based on grains, legumes, and other high Anti-nutrient foods may be a serious health concern, since so many nutrients are flushed right out of the gut. To keep your nutrient absorption rates high and help protect your bones, you may wish to minimize your consumption of Anti-nutrient-heavy foods. Vitamin D is second probably only to calcium in it’s importance for bone health. Vitamin D, much like magnesium, is necessary for absorbing calcium into your bones. Sunlight is the most natural and effective way to get vitamin D. Someone with relatively fair skin may get enough vitamin D by getting 40% of their body exposed to the sun for about 20 minutes of noontime sun every day. Someone with darker skin will need more time, since lighter skin in part evolved in the first place to help the body absorb more rays from the sun as people migrated further away from the equator. If you cannot get this kind of sun exposure, you may wish to consider taking a vitamin D supplement. I currently take about 1000 IUs of vitamin D a day, though most people opt for more like 5000 IUs. It is important not to get too much vitamin D, however, so if taking more than a minimal dose, consider getting some bloodwork done and consulting with your doctor. I recommend a supplement like this one. Vitamin D is only ever really effective if in proper balance with vitamins A and K.
Moreover, vitamin K2 (there are forms K1 and K2) itself is important in the knitting together of strong bones. Vitamin A is best obtained from egg yolks, from liver (you can try desiccated liver supplements if you don’t like eating liver), or from cod liver oil supplementation. Cod liver oil also provides vitamins D and K2, which makes it a great way to meet all three of these vitamin needs. You can also get vitamin A from foods that contain beta-carotene like carrots, mangoes, and sweet potatoes, but this is a less assured way of getting vitamin A since that relies on having a particular strain of bacteria in your gut to convert the beta carotene to vitamin A.
Vitamin K1 is best obtained from leafy greens. Vitamin K2 can be made out of K1 but the process is incredibly inefficient and it is best to make sure to get K2 in the diet as well. The best sources of K2 are grass-fed butter (or ghee), grass-fed liver (it must be grass-fed to have K2 in it – here’s that desiccated liver supplement again), or fermented cod liver oil. Estrogen is also crucial for stitching together calcium to make strong bones. This is why women suffer from osteoporosis at twice the rate of men. Hormones levels fluctuate and may drop due to some health conditions throughout life, which reduces bone strength. It is incredibly important for women to have strong bones when they are young, particularly in their teen years and their twenties. Bone growth is just finishing up at this time, and during their 20s women’s bones are in the process of solidifying and strengthening (as much as they can) for the rest of adulthood. Unfortunately, this is a time at which women are at particularly high risk for decreasing their estrogen levels. Any sort of restrictive eating, starvation-type behavior, low carbohydrate diets, low fat diets, vegetarian diets, or excessive exercising can make a young woman’s estrogen levels drop precipitously (like mine did). This can lead almost immediately to osteopenia, which, if not corrected for, will endure and cause sigificant bone problems later on in life. The best way to make sure your estrogen stores stay strong while young is to steer clear from restrictive food behaviors. Eat when hungry and stop when full. Don’t count calories. And if an athlete, make sure to always refuel after exercising. It is also important to keep stress levels as low as possible, since high and/or chronic stress can also cause the female body to stop producing hormones, and estrogen in particular. To read more about low estrogen, starvation signals in the body, and female health, check out this post on hypothalamic amenorrhea, or this one on the physical symptoms of starvation signals. It may be easier said than done, but keeping estrogen levels in balance with other hormones while going through adulthood, perimenopause, and menopause cacn be extremely helpful for preventing osteoporosis. Some women choose to take Hormone Replacement Therapy during menopause, which can alleviate menopause symptoms like insomnia and low libido while simultaneously support bone health. Yet there is an unclear relationship between HRT and certain female cancers, so many women choose to abstain from HRT. If you can minimize inflammation in your body, keep your blood sugar and insulin levels in control, sleep as well as possible, and minimize stress throughout menopause, you should be able to keep your estrogen levels high enough to maintain sufficient bone health (presuming that you kept your bones strong and healthy throughout your younger adulthood). You may also wish to experiment with phytoestrogen intake–that is, with soy, flax, or chia seeds–to see if that helps boost your estrogen levels. (You can read more about my menopause and phytoestrogen recommendations in this post on hot flashes). However, even while keeping estrogen levels elevated throughout menopause can certainly help, I cannot stress enough how important healthy estrogen levels throughout the earlier reproductive years are for bone health. Around 25-30% of the weight of bones is made of collagen proteins. This makes collagen an incredibly important element in bone health. Collagen is both produced by the body by a matrix of amino acids from protein, and can be utilized if consumed from food or supplemental form. High quality complete protein is thus a must. Fortunately, all proteins that come from animal sources are “complete,” so anyone who eats a paleo diet is safe in that regard. Be sure to consume at minimum 50 grams of animal protein a day, and bump that up to about 75 for a minimum if you are significantly atheltically active. You can consume collagen directly by eating bones, joints, tendons, and skin from animals. How? You can make bone broth, you can actually eat joints, tendons, and skin, or you can consume gelatin (here’s a good one) by adding it to soups, jellos, yogurts, salads, or whatever you like. I would recommend doing this at least once a week if you are concerned about your bone health. Conventional wisdom is also ignorant about the important role inflammation plays in bone health. Several different inflammatory cytokines have been implicated in the development of osteoporosis. Chronic inflammation is considered a risk factor for the disease. Unfortunately, like “good gut health,” writing up inflammation is impossible to do with just a few short paragraphs. Inflammation has many causes and many possible ways to remediate it. The most important causes of inflammation in the diet to eliminate are omega 6 seed oils such as vegetable oil, canola oil, soybean oil, rapeseed oil, sunflower oil, and the like. These should really only be consumed at a very minimal level. They need to be in balance with omega 3 fatty acids, which can be obatined from that cod liver oil supplement I referred to earlier. Refined sugar is also inflammatory, so processed desserts, sodas, and the like should be avoided. Cereal grains and dairy are also fairly inflammatory, so should be avoided if inflammation is a concern. A paleo, natural-foods diet rich in vegetables and fruits, healthy fats like olive oil, coconut oil, ghee and other animal fats, and healthy protein sources like grass-fed beef and wild caught fish is an excellent way to combat inflammation. This does wonders for osteoporosis, and wonders for the rest of the diseases of civilization like heart disease, diabetes, stroke, cancer, alzheimer’s, and the like. 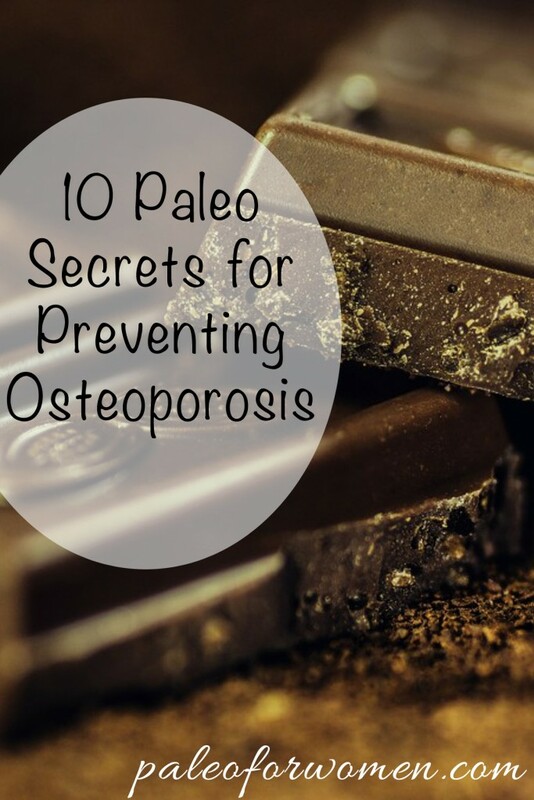 And with inflammation, I wrap up my list of paleo secrets to help with osteoporosis. What do you think? Different opinion? Different experience? More resources to recommend? I’d love to know!! Hey Stefani, thanks for the round up of advice. I tell people all the time that there’s so much more than calcium when they’re concerned about bone health… but then I forget what else to tell them, other than magnesium.